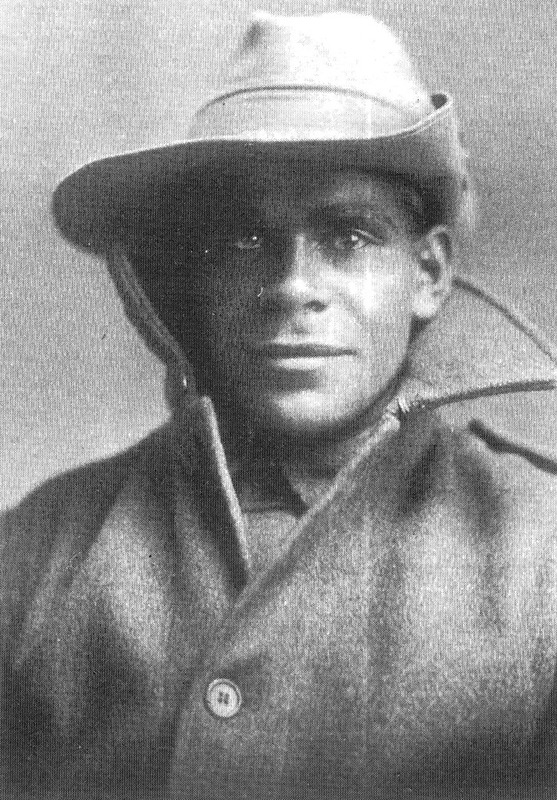 A project aimed at collecting the stories of Aboriginal soldiers from South Australia who enlisted during the First World War. Wow, it's been ages since I've posted, but it's time I got back to it. Thanks to the brilliant Philippa Scarlett and her Aboriginal and Torres Strait Islander Volunteers for the AIF, we now have another nine names. They include the three Waller brothers from Kangaroo Island, one of whom was killed on Gallipoli. Seven of the nine saw active service, for the other two it was the usual excuse ("medically unfit") which seems to be code for "Aboriginal". Very pleased that two new names have come to light over the last week or so. Firstly, 625 Private John William Stewart of Port Augusta, who served with the 32nd Battalion and is buried in West Terrace AIF Cemetery along with three other Aboriginal soldiers of the First World War. Secondly, Corporal Frederick Prentice MM of Powell's Creek NT (and Wallaroo SA) who served with the 1st Pioneer Battalion. 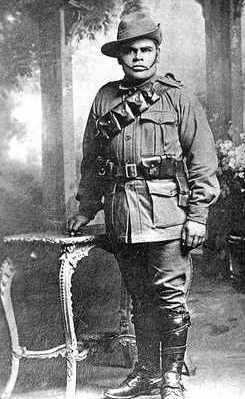 That brings the total to 38 Aboriginal soldiers from SA that saw active service in the First World War, and two that received the Military Medal for acts of gallantry and devotion to duty under fire. Raymond Charles 'Charlie' Runga was a son of Charles Runga and Eliza Runga (nee Bourne). Charles, a widower, had married 21 year old Eliza in 1887 when Charles was 44. Charles was a renowned railway ganger and ploughman, having been the first Aboriginal man to have competed in a ploughing match at Mt Barker Springs in 1865. It was believed that Charles was originally from Tjowilla/Chowilla country north-east of Renmark. Charles subsequently worked on the Kingston SE to Naracoorte railway line in the years before Charlie's birth, and Charlie was born at Naracoorte on 21 September 1889. He had two brothers, Arthur, who died in infancy, and Frederick. Charlie worked as a farm labourer prior to the First World War, and had been working at Hopetoun in the Wimmera region of Victoria when he enlisted at Mildura on 28 February 1916. After some much needed dental treatment, Charlie embarked with the 17th reinforcements to the 6th Battalion (a Victorian-raised unit) on the Euripides at Melbourne on 4 April 1916. They spent two weeks in Alexandria before re-embarking for England on 31 May, arriving at Plymouth on 12 June 1916. After intensive training in England, Charlie embarked for France on 22 October, finally reaching the 6th Battalion on 29 December 1916 where it was performing rear area fatigues near Albert. In late January 1917, Charlie entered the trenches for the first time near Albert, and the battalion rotated in and out of the front line in February and early March. Charlie went sick in mid-March 1917 with scabies, but returned to the unit in early April for intensive training due to a reorganisation of the battalion structure. They spent more time in the trenches near Frémicourt, after which the battalion participated in the Second Battle of Bullecourt in May, and the Battle of the Menin Road in September. Charlie was wounded in both arms on 26 October 1917 on the first day of the Second Battle of Passchendaele. He was sent to England to recover, and stayed there until May 1918 when he returned to France. He participated in the Battle of Amiens, then was gassed on 23 August 1918 after the battalion's attack near Herleville Wood as part of the Second Battle of Bapaume. Charlie was again evacuated to England. Whilst in England he received news that he had been awarded the Military Medal for his actions at Herleville. For conspicuous gallantry on the 23rd day of August 1918 at Herleville wood. During the attack, when the left portion of his company had come under exceptionally heavy machinegun fire from a wood in front, this soldier taking charge of a small party dashed forward to the wood and succeeded in capturing two hostile machineguns and their crew of 16 men. On another occasion, later on in the day, this soldier rushed forward alone over 70 yards of ground without a vestige of cover and despite point blank machinegun fire succeeded in bombing the enemy from a communication trench, thus enabling the remainder of his platoon to continue their advance. This latter feat was a heroic example of utter disregard of personal safety and the desire at all costs to worst the enemy, any man of which with one shot calmly aimed could have killed Private Runga. He left UK for Australia on 22 July 1919, disembarked in Melbourne on 2 September 1919 and was discharged on 25 October 1919. On 24 January 1920, Charlie was presented with his Military Medal at Government House, Melbourne. Shortly afterwards he was passing his medal around a group of men in Swanston Street when the medal was not returned. It is not known if he ever received a replacement. His mother Eliza remarried after the death of Charlie's father. Two of Charlie's half-brothers also served in the First World War, Arthur Henry Fox (who survived the war) and Samson Daniel Fox (killed serving with the 38th Battalion in May 1917). After the war, Charlie returned to the Wimmera, but then travelled widely, in 1933 he was in Moree. 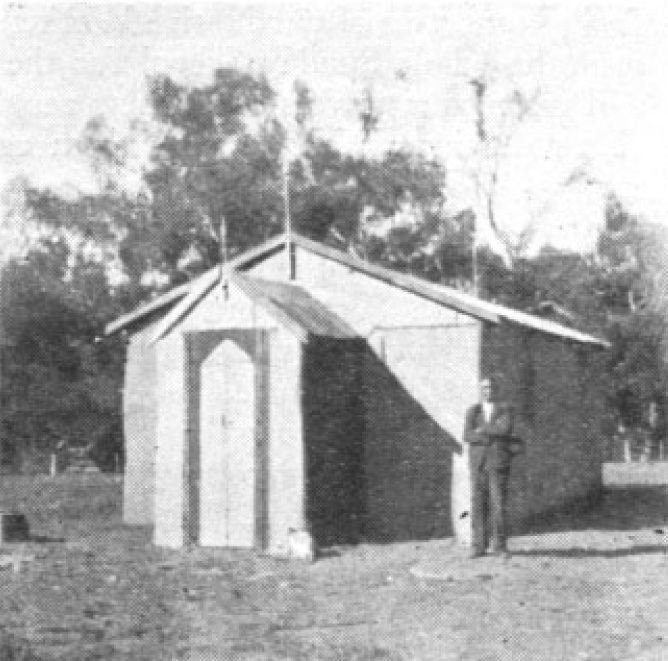 Charlie was church deacon and treasurer at Darlington Point church in the Griffith region of NSW, and helped to build the first church (pictured) in 1937, and rebuild it in 1944-45. He married Emily Glass (nee Kennedy), a Wiradjuri woman, who already had several children from her previous marriage. Emily died not long after her son Jack passed away in 1940. Charlie offered to help at other missions, and built and maintained churches at Cowra and at Moonahcullah mission near Deniliquin in the 1940's. Charlie Runga passed away at Leeton, NSW on 21 March 1956 at the age of 66 years. Before the war, he worked as a labourer in the Meningie district. He enlisted at Oaklands on 15 January 1915, and was allocated to the 8th reinforcements to the 3rd Light Horse Regiment. After seven months training, Alfred embarked on the Morea with the rest of his reinforcements at Adelaide on 26 August 1915. He joined his unit on Gallipoli on 13 November 1915, just as winter set in, with cold biting winds and snow falling for days. Thirty freezing days and nights later, he embarked with the rest of the Regiment, returning to Egypt via Alexandria just before Christmas. The 3rd Light Horse Regiment, along with the rest of the 1st Light Horse Brigade, was allocated to the Western Frontier Force immediately after Christmas. The Western Frontier Force was deployed to counter incursions into the Nile Delta area by the Senussi tribes, and Alfred and the rest of the Regiment operated out of a camp near Wadi Natrun about 50 miles west of Cairo. Whilst there, Alfred came down with the mumps, and spent most of February 1916 in hospital. In early March, not long after Alfred had returned from hospital, the Regiment entrained for Girga, about 300 miles south of Cairo, and commenced patrolling to stop the Senussi from approaching the Delta from the western oases. Their time in around Girga was very uncomfortable, as sandstorms were frequent and sandflies thick. They remained in the area until mid-May 1916 when they were relieved to return to Cairo by train. Within a few days they were riding towards the Suez Canal, and after a few days supporting the British infantry along the Canal, were sent into the Sinai desert to the town of Romani. By mid-June, the Regiment was having intermittent contact and skirmishes with Turkish patrols. In early August 1916, the 3rd Light Horse Regiment defended bravely for two days against the attacking Turks during the Battle of Romani suffering 14 killed, 36 wounded and 4 missing. Nearly 100 horses were killed or missing. Alfred lost his horse along with everything on it. The Regiment, along with the rest of the 1st Light Horse Brigade, then followed up the retreating Turks, capturing Katia and pressing the Turkish rearguard. Returning to Romani in late 20 September, Alfred was awarded a week's field punishment after being caught lying down on sentry duty. In October the Regiment was sent back to Cairo for six weeks rest and refit. In late December 1916, the Regiment raided El-Maghdaba deep in the Sinai, capturing 284 Turks. After two nights without sleep, the Regiment rode back to El-Arish on the coast, many of the troopers recounting hallucinations of houses and barking dogs on the ride due to lack of sleep. In mid-January 1917, the Regiment raided Rafa, on the border of Egypt and the Ottoman Empire, but suffered 59 casualties before withdrawing back to El-Arish. In February 1917, Alfred was transferred to the 1st Machine Gun Squadron, which worked in direct support of the 1st Light Horse Brigade, which included the 3rd Light Horse Regiment. After several weeks training, Alfred returned to El-Arish where the Squadron made camp. After a period in and out of the front line near Rafa, during which the 1st Light Horse Brigade suffered more than 50 casualties and 100 horses killed or wounded, Alfred was court martialled in July 1917 for refusing to take horses to water when ordered. Initially sentenced to four months imprisonment with hard labour, this was commuted to two months which he served at No. 1 Detention Compound, Moascar, in Egypt. Rejoining the Squadrion at Rafa beach in early October 1917, he served until 28 October when he was admitted to hospital for a week, then again to hospital in early November with a corneal ulcer. After some training in Egypt, he didn't return to duty with the Squadron until May 1918, when the Brigade was in Jericho. The Brigade repelled a Turkish attack in mid-July 1918, suffering 21 casualties, the 3rd Regiment alone taking 358 German and 67 Turkish prisoners. After a bout with sandfly fever in August 1918, Alfred rejoined the Squadron in late September 1918, at which point the entire Brigade had been brought to its knees, not by the Turks , but by malaria. In early October 1918, more than 500 men of the Brigade were evacuated with the disease. Alfred was back in hospital himself by late October, and didn't return to the Squadron until May 1919. He embarked for Australia later that month, and was discharged in Adelaide on 26 August 1919, four and a half years after he enlisted. After the war, Alfred worked a number of jobs including shearing, horse breaking and fishing, and spent most of his life working on the Cameron family properties on the Coorong near Meningie. His mother Jessie Cameron died in 1928, and his father Alfred Cameron senior, in July 1949 at the age of 89. 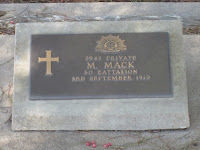 Alfred Junior died a few weeks later at the age of 57, and was buried in the Meningie cemetery. Photograph: from Ngarrindjeri ANZACs by Doreen Kartinyeri, p. 18. 697 Private Charles Owen of Robe who served in France with the 24th Battalion. That brings the total to 36 South Australian Aboriginal soldiers with active service in the First World War. A new name was added to the list today, 1975 Private Stanley Livingstone Copley of Plympton who served in France with the 1st Division Motor Transport Company. That brings the total to 33 South Australian Aboriginal soldiers with active service in the First World War. Miller Mack was born at Point McLeay in 1894, his parents were John Mack and Margaret 'Pinkie' Mack (nee Karpany). He worked as a labourer prior to enlisting at Adelaide on 23 August 1916. After initial training at Mitcham Camp (located in present day Colonel Light Gardens), he was allocated to the 7th reinforcements to the 50th Battalion. The 50th Battalion was a South Australian battalion, the sister battalion of the 10th Battalion, which was the first battalion raised in South Australia for service in the First World War. He sailed to England with the rest of his reinforcements, leaving Adelaide on the 'Afric' on 6 November 1916, and arriving at Plymouth, Devon on 9 January 1917. Miller was sick during the voyage, and spent some time in the ship's hospital. After disembarking in England, Miller and his comrades were sent to the 13th Training Battalion at Codford in Wiltshire for further training in trench warfare. During his four months training, Miller spent several weeks in hospital with colds and influenza. In May 1917 he boarded a ship for France and after moving through the various depots, was taken on strength of the 50th Battalion at Buire, northern France. A few days later, the battalion boarded a train at Albert, and were transported to Flanders in Belgium. In early June 1917, the 50th Battalion was part of the Battle of Messines. On 7 June 1917 at 3.10am, nineteen enormous 'mines', large tunnels filled with explosives, were exploded beneath the German trenches between Messines and Wytschaete, which instantly killed approximately 10,000 German soldiers. This is believed to have been the largest man-made explosion in human history until the test of the atomic bomb in July 1945. The troops which rushed across the craters included Miller Mack and the rest of the 50th Battalion who were supporting the second phase of the attack. They captured all their objectives, the Germans having been completely stunned by the force of the explosion and the following artillery barrages and attacks. Thousands of Germans were captured. The 50th Battalion followed up with a night attack on 10 June, which captured more enemy trenches. The battalion suffered 157 casualties during the Battle of Messines. Miller was evacuated to hospital in early July 1917, still suffering from a persistent cough which he just couldn't shake. He was admitted to hospital in England on 17 July with severe bronchial pneumonia, and by September had lost nearly 20 kilograms in weight and been diagnosed with tuberculosis. In late September he was shipped back to Australia to be discharged as medically unfit, but needed hospitalisation at Torrens Park and then at the Nunyara Sanatorium at Belair prior to being discharged in May 1918. He returned to Point McLeay in November 1918, but was very unwell. He was admitted to the Bedford Park Sanatorium for returned soldiers with tuberculosis, where he died on 3 September 1919, almost exactly two years after his diagnosis with the disease. He was buried the following day at the West Terrace Cemetery, just outside Light Oval which had already been set aside for the AIF Cemetery. His funeral costs were paid by the Army. In January 1920, Mr Mat Kropinyeri wrote to The Register newspaper asking for donations to build a memorial for Miller at the cemetery, as his grave had no headstone. At that time, he was the only Aboriginal returned soldier buried in West Terrace cemetery. In response, a donation of several pounds was received by The Register from the patients at the Bedford Park Sanatorium. They wrote that he had a "kindly and manly nature, he endeared himself to us all, and when he 'went west' we felt we had lost a dinkum pal. Those of us who knew him in camp and abroad can testify to his sterling qualities as a soldier and a man." In the end though, it was the Office of Australian War Graves that placed a marker on his otherwise unmarked grave.